The farewell speech did not address the most important domestic issue of his era: simmering social conditions in the United States, particularly the increasing expression of anger and frustration within African-American communities that had suffered brutal and unequal treatment for too long. A legalist, when the Supreme Court forced his hand, Eisenhower called in troops to see that the decision to de-segregate schools went forward, but it was not an issue he personally championed. the Congress and the Administration have, on most vital issues, cooperated well, to serve the national good rather than mere partisanship, and so have assured that the business of the Nation should go forward. So, my official relationship with the Congress ends in a feeling, on my part, of gratitude that we have been able to do so much together. His words did not betray his fears, expressed in an earlier draft of the speech, that Congress was a fundamental part of the military-industrial complex,[i] a problem that has not diminished with time. For instance, in recent years, pork-barrel earmarks purchase military equipment even the military doesn’t want, including ships, tanks, and many other items. And these are just programs that Pentagon insiders think are wasteful, see the Project on Government Oversight (POGO) and the Special Investigator General for Afghanistan Reconstruction (SIGAR) as two among many voices drawing attention to broader areas of DoD waste. America’s leadership and prestige depend, no merely upon our unmatched material progress, riches and military strength, but on how we use our power in the interests of world peace and human betterment….to strive for less would be unworthy of a free and religious people. This was not his first foray into the question of peace, having sought to de-escalate tensions with the USSR, a task made easier with the death of Stalin in 1953, and proposing “Atoms for Peace,” a program that sought to develop nuclear capacities for non-military uses, like energy. However, the speech was perhaps his most powerful articulation of an internal threat to peace. Against the backdrop of the Cold War, and drawing on his own experience as a senior military officer who knew well (qua Clausewitz) that concerning the outcomes of any military action, the ratio of the unpredictable to the predictable is high, Eisenhower stressed that the “danger promises to be of indefinite duration.” To meet it successfully, the U.S. did not require the “emotional and transitory sacrifices of crisis,” but rather steady leadership and the political art of balancing interests, such that trade-offs between the present moment and the future, competing sources of power, and cost and advantage would be carefully weighed. While crises will certainly continue, he cautioned, one must avoid the temptation to seek “spectacular and costly action” in the hopes of forging some sort of miraculous conclusion. Threatening to upend such a careful balance was the emergence of a permanent military industrial sector, unprecedented in American history. In the context of the Cold War, these words referenced the uninterrupted development of major weapon systems and the way in which the economic benefits of their procurement influenced political life. This threat remains with us. As example, today military spending so outrageously outpaces the civilian capacities within U.S. foreign policy, that a catch-22 develops[ii] whereby existing capacity means the military takes on ever more tasks—like humanitarian aid delivery, development programming, global public health, and intelligence, simply because it is so much better resourced and hence more capable, and hence is further invested in. For instance the 2016 budget deal, allocated $573 billion for defense and another $58.6 billion for overseas contingency (war effort). The State Department and USAID – whose combined budgets were $50 million — are caught in a cycle of underfunding, with reduced capacity and influence. Today, the US military is an enormous global logistics system dressed in camouflage. Those engaged in war fighting, who know the deep cut of violence, compose only a tiny sliver of its overall personnel: of the 1.53 million total active duty US military personnel, some 450,000 are stationed overseas, and this is in addition to 811,000 reserve component end strength, and 773,000 civilian full-time equivalents. [iii] These figures do not include contractors, who play ever increasing roles both in and out of active combat. As a country, the United States has failed to invest in its diplomatic mechanisms for peaceful resolution of conflict, and instead prioritizes the militarization of all functions of its international relations. Today we have many fewer politicians with military experience, and neither of our two major choices for President have so bravely put use of force in its proper place, subordinated to political solutions sought through diplomacy, and in the service of world peace. 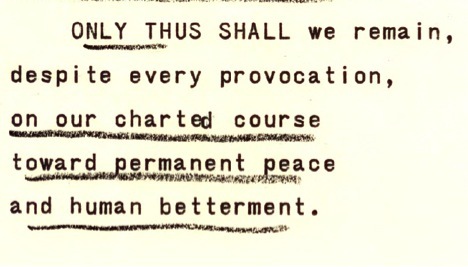 Nor can we today conclude, as Eisenhower did, that despite failings in the pursuit of peace that “war has been avoided.” We live in a time when war is no longer a state of exception; it has emerged from behind its shadow of illegitimacy and is lauded as patriotism par excellence by those who do not suffer its impact. [i] See, Evan Thomas, who writes: “Staff Secretary Andy Goodpaster routinely recorded Ike’s gripes about the coziness between defense contractors and congressmen. Goodpaster later said that Eisenhower would have referred to the ‘military-industrial-congressional complex,’ but left out Congress ‘out of respect for the other branch of government’” (399), in Thomas, Evans. 2012. Ike’s Bluff: President Eisenhower’s Secret Battle to Save the World. Boston: Little, Brown and Company. [ii] See Rosa Brooks.2016. How Everything Became War and the Military Became Everything: Tales from the Pentagon. New York: Simon & Schuster.